Industrial Safety Trainers headed down to the waterfront in Barrie Ontario to take part in the 2017 Steps For Life. The team was ready for anything, but were glad that the weather stayed fairly dry. 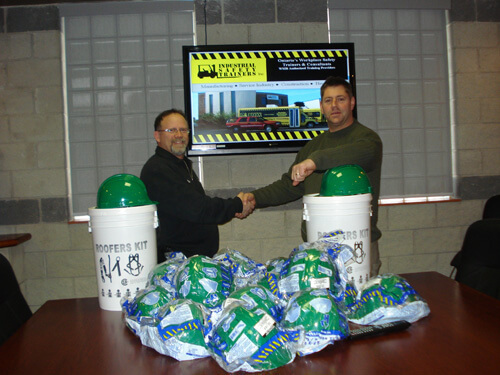 Industrial Safety Trainers in proud to support this cause every year, rain or shine! 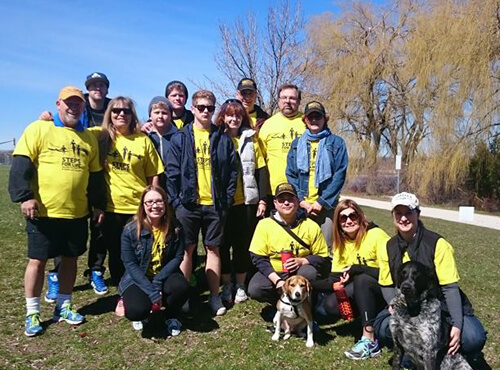 The Steps for Life Walk is an annual fundraising event organized by Threads of Life to raise awareness and support for families affected by workplace tragedies. 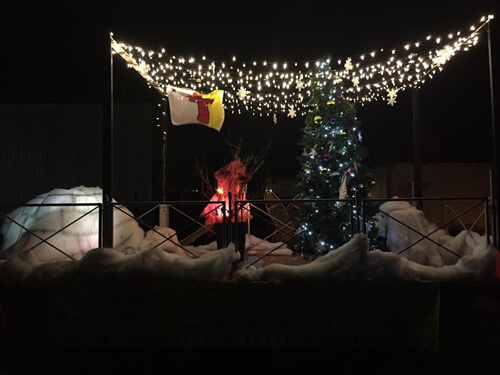 Industrial Safety Trainers created a float in honour of our great customers in Nunavut for the Parade theme “Christmas Around the World” in the Barrie Santa Claus Parade. During Breast Cancer Awareness Month, IST supported Dress for The Cause by hosting 3 bake sales that went on during training courses at our Barrie Head Office. All funds raised will be put toward the Breast Cancer Society of Canada! July 2016—Industrial Safety Trainers went for a cold treat in support of Miracle Treat day! Industrial Safety Trainers was proud to have taken part in the Steps for Life Walk once again on for 2016! 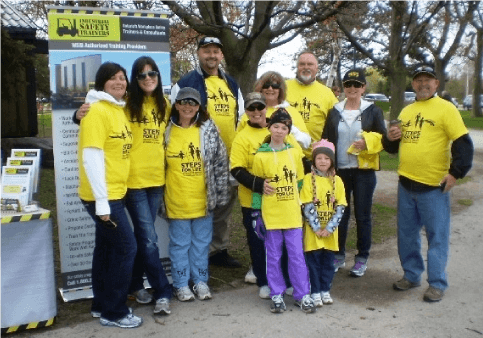 The Steps for Life Walk is an annual fundraising event organized by Threads of Life to raise awareness and support for families affected by workplace tragedies. STEPS FOR LIFE 2015 – $982.50 RAISED! Industrial Safety Trainers is proud to have taken part in the Steps for Life Walk once again on May 2, 2015! With $982.50 raised and 15 IST participants, we are proud to announce that another year has been a success! 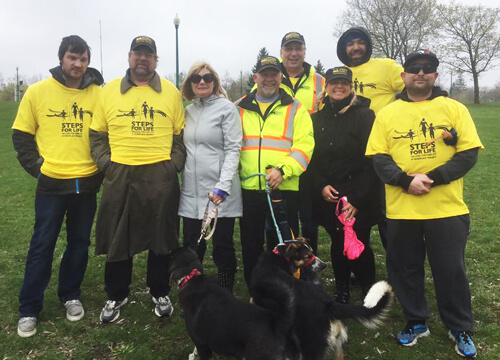 The Steps for Life Walk is an annual fundraising event organized by Threads of Life to raise awareness and support for families affected by workplace tragedies. 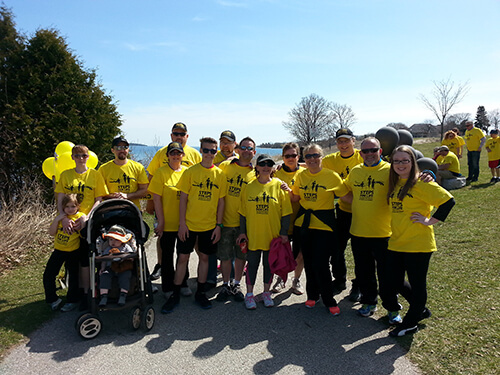 On Saturday May 5th, the team at Industrial Safety Trainers Inc. ‘The Bus Patrol’ raised over $600.00 by taking part in a 5km walk along the lake at Centennial Park in Barrie. Organized by Threads of Life, a national registered charity dedicated to supporting families of workplace tragedy, the purpose of the event is to help families who have been impacted by a workplace fatality, a severe injury, or occupational disease. The walk helps raise awareness about the importance of Health and Safety in the workplace. Mayor’s Employer of the Year! 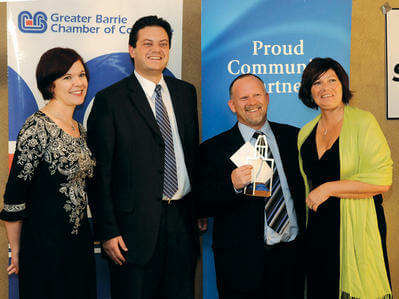 At the 9th Annual Business Awards Gala on November 30th, the Barrie Chamber of Commerce presented Industrial Safety Trainers Inc. with the Mayor’s Employer of the Year award! Lesley Harris – Consultant and Trainer at Industrial Safety Trainers Inc., Barrie Mayor Jeff Lehman, Randy and Cathy Dignard – President and Vice President at Industrial Safety Trainers Inc.
Season’s Centre for Grieving Children. In our efforts to give back to the communities that support our team and families, we actively support the Season’s Centre for Grieving Children. Industrial Safety Trainers Inc. and our friends at Northern Safety in Barrie were able to provide Mark Gelinas from Eastview Secondary School with the necessary tools to allow the students to safely work on various construction projects as part of their volunteer community hours commitment. Students will be working on projects with Habitat for Humanity, park clean up and maintenance, and assisting with various construction projects within the community.